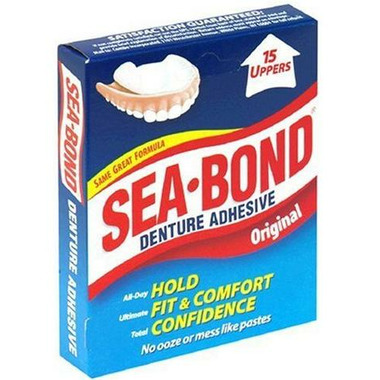 Sea-Bond Denture Adhesive is not a paste or a powder, but a thin wafer seal with three powerful adhesives that holds dentures in place all day without the ooze and mess of pastes. Available in Original (Flavor Free) and Fresh Mint varieties. Be warned: You have to cut this each one of these exactly to size. It then moves around to outside of the denture and does not stay in place. If you try to use just a strip, it moves around even more. This may be because I have a small mouth and therefore small dentures, so the product must be trimmed all the way around. I find this product extremely helpful in keeping my dentures from "slipping" out of place. Total waste of time & money. Heavy on the time. Believe it or nuts, according to the denturist who fitted me, I've got a SMALL mouth. Which means plenty of cutting and trimming. Finally, when you think you've got it right, you apply the moistened wafer to the denture, and slam it in your mouth. Later that morning, you go to eat something that's not very daunting, like a breakfast sammich - a sausage & egger, and the stupid wafer's slipping out from the back of the denture pallet, trying to gag me! It did it twice, and with me, two strikes is all they get. Ask yourselves a simple question - what takes the least amount of time? ... Applying a small bead of PolyGrip around the gum line of your dentures, or cutting out paper dolls all morning when you need to be getting out the door instead? I might've felt differently about 'em if they'd've stayed glued, but they didn't so it's nyet Soviet. I'd've sent them back, but they're not worth the postage. Holds OK, but not as well as the Polident Strips. But clean up is much easier thant the strips.